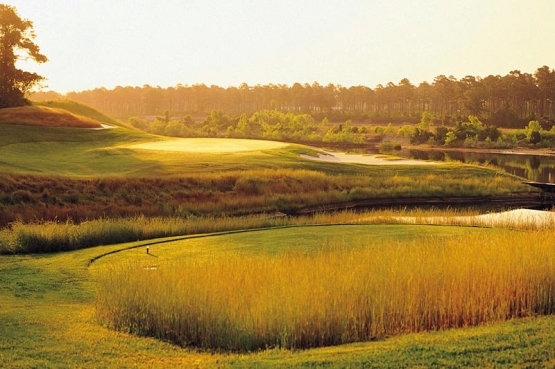 The Grande Dunes Resort Course is an award winning Robert Rulewich Group design. In 2009 it was named the “National Golf Course of the Year” by the National Golf Course Owners Association. It offers the finest in Myrtle Beach golf. This links style course sits high on a bluff that offers spectacular views of the Intracoastal Waterway, Grande Dunes Marina and the Marina Inn at Grande Dunes. Seven holes are played along the Intracoastal Waterway. The golf course features wide Bermuda grass fairways that lead to newly redone Champions Bermuda greens. The fairways have mild undulations while the greens are moderately contoured. If you are looking for a Myrtle Beach golf lesson, be sure to check out the Ritson-Sole Academy at Grande Dunes. Private hourly lessons with video analysis are available. Golf Magazine consistently rank the Ritson-Sole Academy in its “Top 25 USA Golf Schools”. It is the perfect place for you to get some world class Myrtle Beach golf instruction. The Grande Dunes Resort Course offers the ultimate Myrtle Beach golf experience and with its convenient location just off of Hwy. 17 and gives you access to many of the great Myrtle Beach attractions. Just a wedge shot away are some of Myrtle Beach’s world class show venues such as Alabama Theatre, Pirates Voyage and the Palace Theatre. While planning your South Carolina golf vacation consider adding this wonderful golf course to your Myrtle Beach golf package. Book your next Myrtle Beach vacation today at any of the wonderful Myrtle Beach hotels or North Myrtle Beach condos. What can we say? Absolutely beautiful course.I don't know much about how golf courses SHOULD be as far as the technical stuff so I judge on how much I enjoyed it and this was tops. Great food in Clubhouse too. Very good, turf ok, (was excellent in 2009), very good greens, comparable quality available at lower prices, has mediocre GPS, so get yardage book.